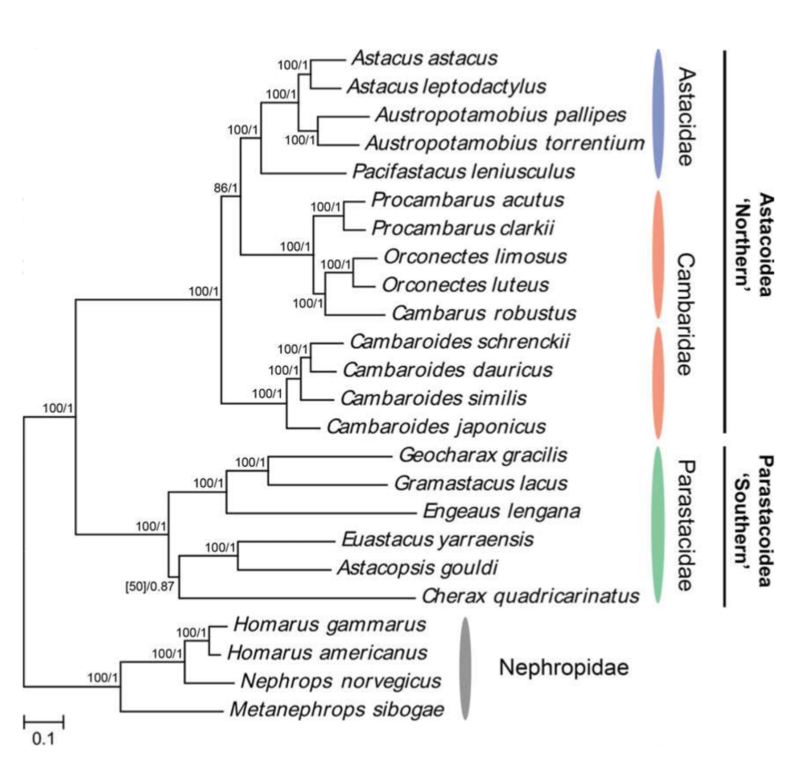 Authors: Grandjean, Frederic; Tan, Mun Hua; Gan, Han Ming; Lee, Yin Peng; Kawai, Tadashi; Distefano, Robert J.; Blaha, Martin; Roles, Angela J.; Austin, Christopher M.
Brief summary of the paper: Molecular phylogenetics has benefited tremendously from the advent of next-generation sequencing, enabling quick and cost-effective recovery of whole mitogenomes via an approach referred to as ‘genome skimming’. Recently, genome skimming has been utilised to recover highly repetitive nuclear genes such as 18S and 28S ribosomal RNA genes that are useful for inferring deeper evolutionary relationships. To address some outstanding issues in the relationships among Northern Hemisphere freshwater crayfish (Astacoidea), we sequenced the partial genome of crayfish species from Asian, North American and European genera and report the successful recovery of whole mitogenome sequences in addition to three highly repetitive nuclear genes, namely histone H3, 18S and 28S ribosomal RNA. Consistent with some previous studies using short mtDNA and nuclear gene fragments, phylogenetic analyses based on the concatenation of recovered mitochondrial and/or nuclear sequences recovered the Asian cambarid lineage as basal to all astacids and North American cambarids, which conflicts with the current taxonomic classification based on morphological and reproduction-related characters. Lastly, we show that complete H3, 18S and 28S ribosomal RNA genes can also be consistently recovered from a diverse range of animal taxa, demonstrating the potential wide utility of genome skimming for nuclear markers.